District Wise TS VVs Selection list 2018 | Vidya Volunteers Selection List in Telangana: #District Wise TS VVs Selection list 2018 Vidya Volunteers Selection List 2018 TS Vidya Volunteers #Final Selection list 2018-19 TELANGANA VV MERIT LIST-2018-19 Mandal Wise TS VV Selection list 2018 Kamareddy Nalgonda Mahabubnagar Adilabad Nizamabad Karimnagar Medak Warangal Rangareddy Khamam District wise VVs Selection list 2018. Telangana VVs Vidya Volunteers Selection LIST 2018- Download Telangana TS All District VVs Vidya Volunteers Selection List 2018. తెలంగాణ రాష్ట్ర ప్రభుత్వం ఇటీవల విడుదల చేసిన విద్య వాలంటరీ వివరాలు సెలెక్సేన్ లిష్ట్ వివరాలు జిల్లాల వారీగా అదిలాబాదు ఏజెన్సీ మెదక్ సంగారెడ్డి జనగామ సిద్దిపేట వరంగల్ రూరల్ జయశంకర్ భూపాల జిల్లా సిద్దిపేట జిల్లా నల్గొండ జిల్లా కేవీ ఆసిఫాబాద్ జిల్లా నిజమాబాద్ జిల్లా వికారాబాద్ జిల్లా జిల్లాల వారిగా దరఖాస్తు చేసిన అభ్యర్థులు వారి వారి జిల్లాల ఆధారంగా డౌన్లోడ్ చేయగలరని మనవి. Director Of school Education Telangana Hyderabad Issued Proceeding No.44/PS2-2/2018 Dated:11-07-2018 to Engage 16781 Vidya Volunteers For the academic year 2018-19 with the Honorarium of Rs.12,000/- Per month. TS Vidya Volunteers 2018-19 Online Applications @ cdse.telangana.gov.in. Online Applications Started from 13-07-2018 and Last Date of Online Applications is 16-07-2018.After Verification Process Selection list of TS Vidya Volunteers Will be disply on DEO Sites and also Communicated To MEOs of All District. Then after Final Selection List will be display as per schedule. Selected VVs have to join their Duties from 20-07-2018. 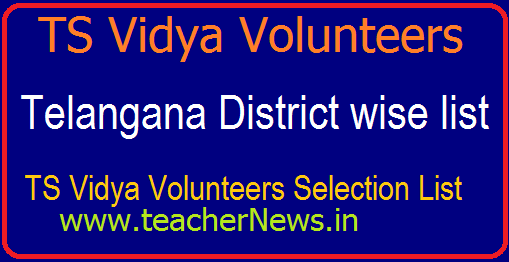 Download Vidya Volunteers final Selection list District/ Mandal/School wise selection list in Telangana. TS VVs Vidya Volunteers District Wise Final Selection List 2018.